We are located on Capitol Hill. 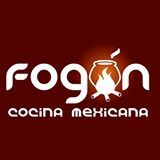 Fogón is a Mexican restaurant with origins in Michoacán, Mexico. We offer a unique perspective on Mexican food to all the residents of Capitol Hill as well as a delicious tequila-based cocktail list.